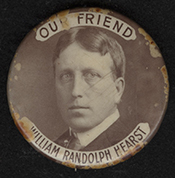 HEARST, William Randolph, (son of George Hearst), a Representative from New York; born in San Francisco, Calif., April 29, 1863; attended the public schools and Harvard University; became editor and proprietor of the San Francisco Examiner in 1887 and established a nationwide chain of newspapers; also owner and publisher of many magazines; elected as a Democrat to the Fifty-eighth and Fifty-ninth Congresses (March 4, 1903-March 3, 1907); was not a candidate for renomination in 1906 to the Sixtieth Congress but was an unsuccessful candidate for governor of New York; unsuccessful candidate for the Democratic presidential nomination in 1904; was the Municipal Ownership candidate for mayor of New York City in 1905 and 1909; organized the Independence League Party in 1908; resumed his publishing business; died in Beverly Hills, Calif., August 14, 1951; interment in Cypress Lawn Cemetery, San Francisco, Calif.
Nasaw, David. The Chief: The Life of William Randolph Hearst. Boston: Houghton Mifflin, 2000; Swanberg, W.A. Citizen Hearst, A Biography of William Randolph Hearst. New York: Scribner, 1961.